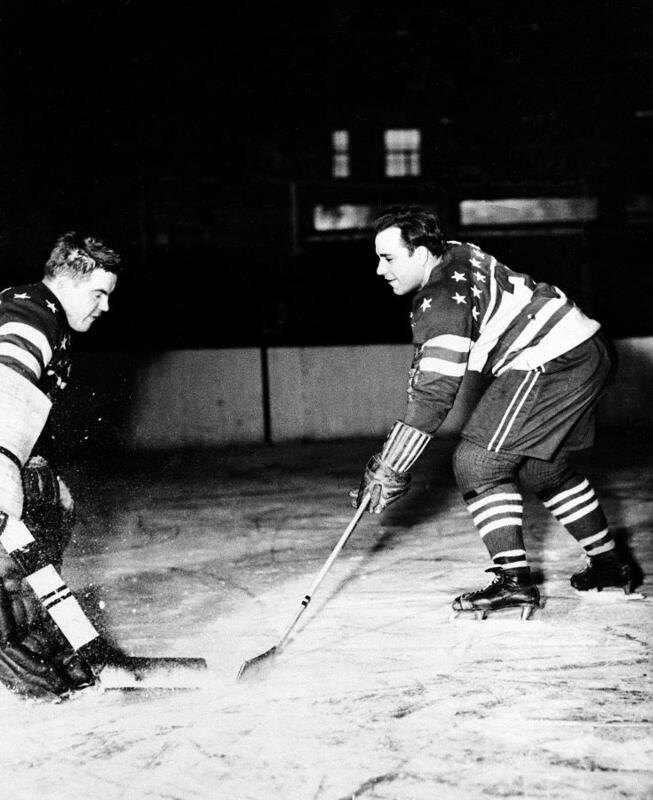 Yogi Berra, a left-handed shot, tries to stick-handle the puck past St. Louis Flyers goalie Don (Mouse) MacDonald in a 1948 scrimmage. Good ol’ Yogi Berra. Maybe the greatest catcher of all time. Won 10 World Series as a player, played in 18 All-Star Games, won three Most Valuable Player awards. Underrated manager. One of the funniest guys in baseball, too, his goofy grin and his delight in the game a wonder to behold. After calling Don Larsen's perfect game in the World Series, it is the chunky Berra who skips up the foul line to leap into the arms of his pitcher, like a child greeting a father returning home after work. Portrayed as a stumble-tongued rube, Berra was smarter than just about everyone. He also was a hockey fan. As a catcher and outfielder for the New York Yankees, he befriended many hockey stars playing for the New York Rangers, including Boom Boom Geoffrion and Gump Worsley, in whom he likely found a kindred spirit. He attended games at the old Madison Square Garden and continued to do so after the team moved into the newer building. He got up at dawn to take his children to hockey practice. In retirement at home in Montclair, N.J., he watched whatever local hockey game was being broadcast. He cheered for the Rangers, the New York Islanders, and the New Jersey Devils. 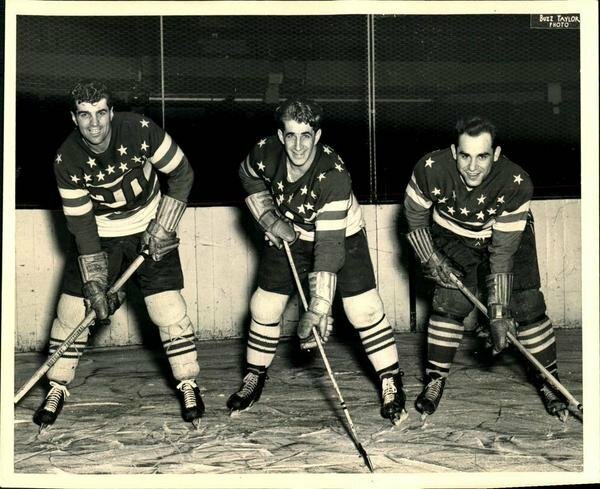 Berra, the son of Italian immigrants, grew up in a blue-collar St. Louis neighbourhood known as The Hill. He and his friends, including fellow future major-league catcher Joe Garagiola, were sports crazy. (Garagiola wrote in his memoir “Baseball is a Funny Game” that others called their ’hood Dago Hill.) Baseball, basketball and football had their season. They also played road hockey and roller hockey. “We didn't have any place to play ice hockey,” he told Randy Schultz of NHL.com in 2005. 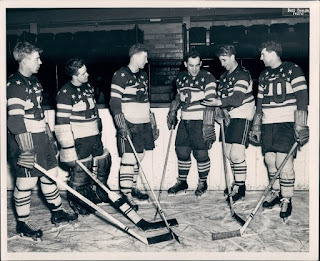 “And if we had, we didn't really have money for skates or some of the other hockey equipment needed. He got his nickname after a bunch of pals watched a movie in which a turbaned snake charmer sat cross-legged, reminding one of the gang of Berra waiting his turn to bat. Lawrence Peter, better known as Larry, became Yogi forevermore. 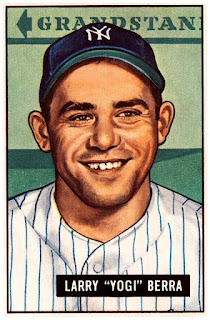 Berra made his big-league debut at the end of the 1946 season after having spent the war battling the Nazis, including taking part in the D-Day invasion. In 1947, he hit a pinch-hit home run, the first in World Series history, as the Yankees defeated the Brooklyn Dodgers in seven games in what the first non-segregated baseball championship. The catcher had an eventful offseason. In February, he crashed his car into a fire hydrant in St. Louis. Several hours later, he turned himself in at a police station, where he was arrested and booked on suspicion of careless driving, destruction of city property and leaving the scene of an accident. He was released on a $500 bond. Meanwhile, he tried to get back in shape by skating at practices at the Arena with the St. Louis Flyers, the local American Hockey League team. A commercial photographer named James (Buzz) Taylor attended one of those sessions, capturing the baseball player on skates and wearing sweater No. 3. Berra tried to score by stick-handling against goaltender Donald (Mouse) MacDonald and posed alongside Hec Pozzo and Don (The Count) Grosso, a former NHLer nearing the end of his playing career. Both hockey players were from Sault Ste. Marie, Ont. The next month, Berra reported to the Yankees' spring training camp at St. Petersburg, Fla., where he found five other catchers vying for his job — Gus Niarhos, Sherman Lollar, Charley Silvera, Ralph Houk and Henry Foiles, a schoolboy. 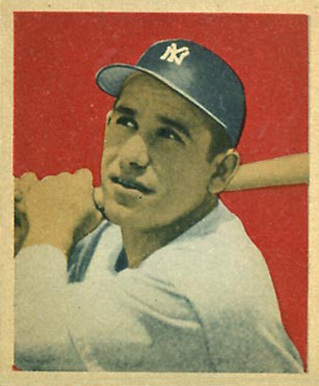 The newspapers hinted Berra was not up to the job of catcher, but the sophomore got support from Yankees manager Bucky Harris. “He is not a cocky kid and he is far from a dummy,” the skipper said. 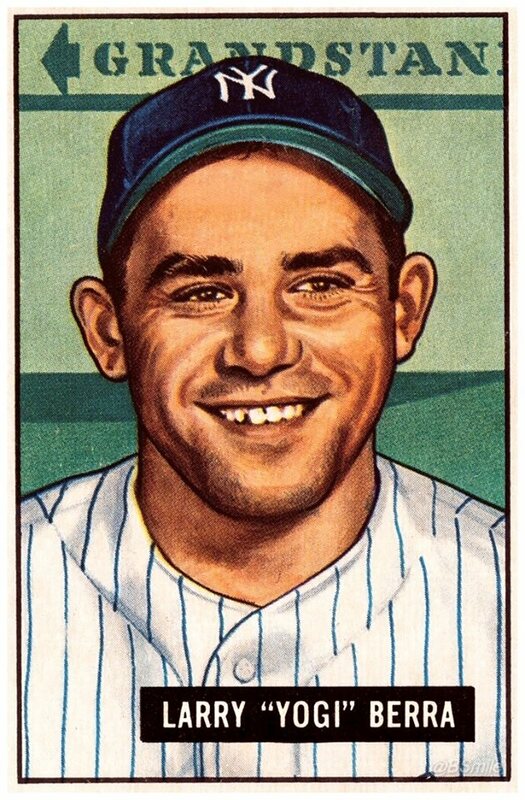 Berra went on to hit .305 with 14 home runs and 98 runs batted-in in a season spent half behind the plate and half in right field. He had launched a career that would take him to the Baseball Hall of Fame and make him an American icon. He died on Tuesday, aged 90. Hec Pozzo (20) and Don Grosso pose with Yogi Berra (right), the New York Yankees catcher who joined his hometown St. Louis Flyers for a practice session in 1948. 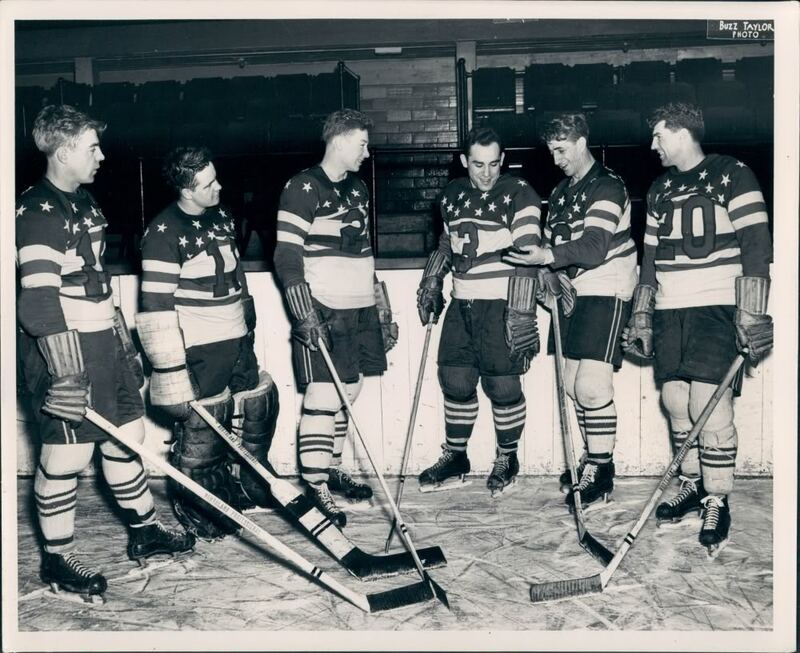 A St. Louis Flyers hockey practice in 1948 included, from left, George Milligan, Don (Mouse) MacDonald, Joe Lund, Yogi Berra, Don Grosso, and Hec Pozzo at the Arena.